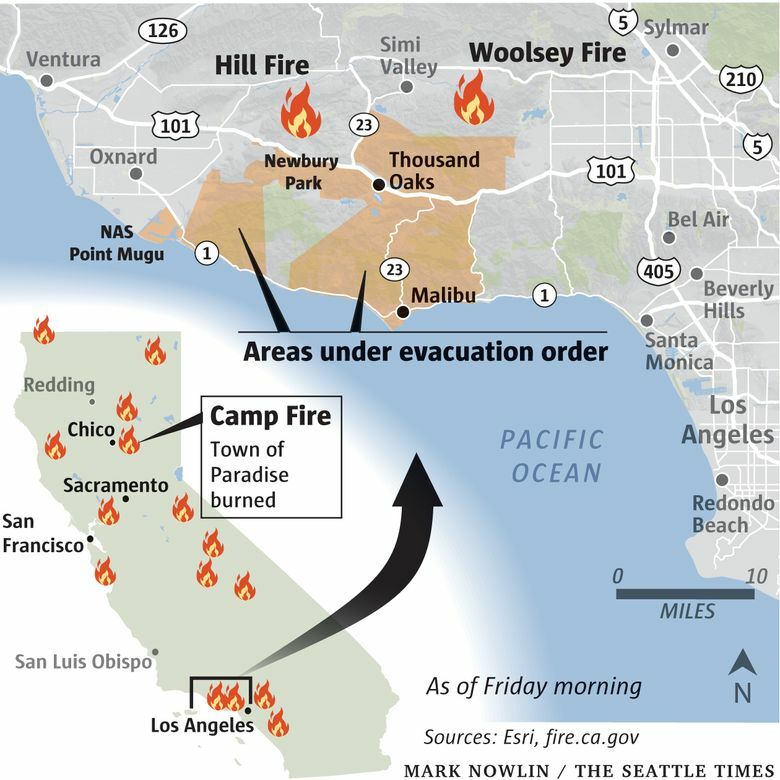 Flames driven by powerful winds forced tens of thousands of people to flee as the fire marched across California's Santa Monica Mountains toward the sea. For Thousand Oaks, which had been considered one of the safest cities in the nation before a gunman massacred 12 people at a country music bar, the spasm of violence jolted the city’s sense of security. Encroaching flames, despite the near-constant threat of fire in the bone-dry state, presented an entirely different hazard. In addition to the large hillside homes that ignited and blazed brightly in the middle of the day, the “Western Town” at Paramount Ranch, a popular filming location that included an old West jail, hotel and saloon, burned to the ground. At the Vallecito mobile home park for seniors, the fire came so quickly that residents had no time to gather medications and documents. With flames bearing down, firefighters carried people from homes and put them in empty seats of their neighbors’ cars, said Carol Napoli, 74. “We appreciate everybody’s efforts and kind prayers for all the people from our victims that lost their lives in the shooting to now what’s happening with people losing their homes,” Foy said. The day before under clear skies and no smoke, thousands gathered along the freeway to watch a motorcade carrying the body of a sheriff’s deputy who was killed when he rushed in to confront the shooter.